I had two dads – a rich one and a poor one. One dad was highly educated and intelligent; he had a Ph.D. and had completed four years of undergraduate work in less than two years. He then went to Stanford University, the University of Chicago, and Northwestern University to do his advanced studies, all on full, financial scholarships. Having two dads as advisors offered me the perspective of contrasting points of view: one of a rich man and one of a poor man. The problem was that my rich dad was not yet rich, and my poor dad not yet poor. Both were just starting out in their careers; both were struggling with money and families. But, regardless of those commonalities, both had very different points of view on the subject of money. One dad would say, “The love of money is the root of all evil.” The other, “The lack of money is the root of all evil.” Having two dads – and loving them both – forced me to think about, and ultimately choose, a way of thinking for myself. I had to think about each dad’s advice and, in doing so, gained valuable insights into the power and effect of one’s thoughts on one’s life. For example: My poor dad had a habit of saying, “I can’t afford it.” My rich dad forbade those words to be used. He insisted that I say, “How can I afford it?” One is a statement, the other a question. One lets you off the hook; the other forces you to think. My rich dad would explain that by automatically saying the words “I can’t afford it” your brain stops working. By asking the question “How can I afford it?” your brain is put to work. My rich dad did not mean ‘buy everything you wanted.’ He was, though, fanatical about exercising your mind â€“ the most powerful computer in the world. My rich dad said: “My brain gets stronger every day because I exercise it. The stronger it gets, the more money I can make.” He believed that automatically saying “I can’t afford it” was a sign of mental laziness. Although both dads worked hard, I noticed that my poor dad had a habit of putting his brain to sleep when it came to money matters. My rich dad, on the other hand, made a habit of exercising his brain. The long-term result was that one dad grew stronger financially and the other grew weaker. Being a product of two strong dads allowed me the luxury of observing the effects that different thoughts have on one’s life. I noticed that people really do shape their lives through their thoughts. The power of our thoughts may never be measured or appreciated, but it became obvious to me as a young boy that there was value and power in being aware of my thoughts and how I expressed myself. I noticed that my poor dad was poor not because of the amount of money he earned “which was significant” but because of his thoughts and actions. As a young boy, having two fathers, I became acutely aware of being careful in deciding which thoughts I chose to adopt as my own and to whom should I listen â€“ my rich dad or my poor dad? 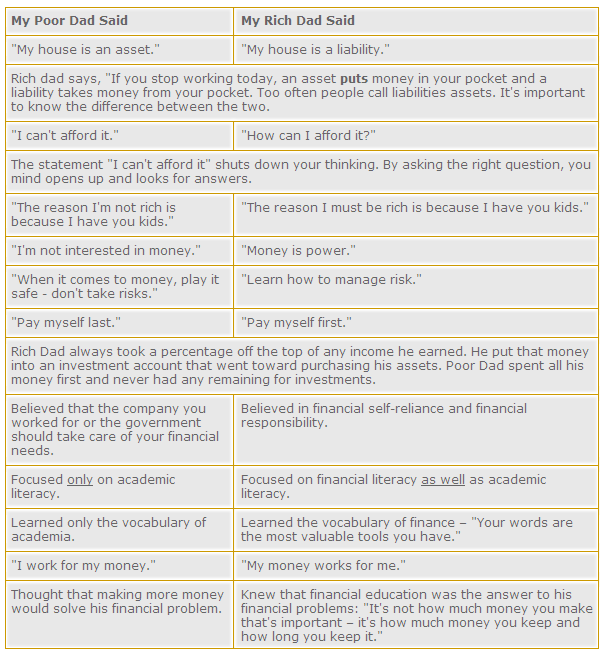 At the age of nine I decided to listen to and learn from my rich dad about money. In doing so, I chose not to listen to my poor dad â€“ my real dad â€“ even though he was the one with all the college degrees. Understanding the difference in attitudes between Rich Dad and Poor Dad is essential to taking the first steps to financial freedom. 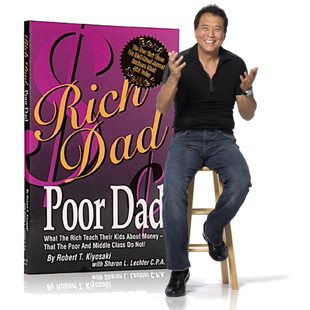 For a comprehensive look at how to battle the Poor Dad mentality and adopt the Rich Dad state of mind, learn more about the tools we offer to help you on your journey to financial freedom. How do you think about that? All difference is real, so which kind of Dad will you choose? It’s all up to you, isn’t it? Memang kita harus belajar dari ahlinya, saya pun baca bukunya Kiyosaki yang lama2. sekarang engga usah beli, udah direview sama dr Nasir. Wah bagus tuh bisa dapet review buku di sini, jadi engga usah baca buku tebelnya… makasih ya dr nasir..
atas kesediaan nya kami ucapkan terima kasih. @dirmanto, Waduh, konsultasi yang mana nih…? 🙂 yang terakhir ya…? apakah benar, klo kesan dari hasil Ct. Scan spt itu adalah terbukti ada’y tumor dalam kepala?? klo iya, apakah berbahaya dan bgmn cara pengobatan’y yg tidak membutuhkan biaya terlalu besar??? tumor tersebut, termasuk tumor jinak or ganas ya k? CT Scan tidak dapat membedakan jinak atau ganasnya sebuah tumor atau benjolan, dia hanya bisa mengatakan bahwa di kepala ada SOL (Space Occupying Lesion) atau ada kelainan yang bisa mendesak ruangan di rongga kepala. Untuk bisa mendiagnosis lebih tepat dan akurat apakah itu benar adenoma hypofisis, SOL di cysterna basalis atau Meningioma dsb, dokter biasanya menganjurkan untuk dilakukan MRI (Magnetic Resonance Imaging) yang nanti hasilnya lebih akurat dan jelas tanpa kabut seperti pada CT-Scan. Kalo proses memang sama, tapi alat dan hasil jelas jauh berbeda. Oleh karena itu soal biaya pasti lebih mahal karena kualitasnya, lagi pula MRI hanya dimiliki oleh beberapa RS besar. Kalo ternyata tumor tersebut jinak, dokter akan menyarankan untuk operasi, karena cepat atau lambat akan mendesak rongga kepala yang terbatas dan akan menimbulkan keluhan sepanjang hidup. Kalo ternyata ganas, dokter pun akan menyarankan untuk operasi dengan tingkat kesulitan yang lebih besar dan resiko yang luarbiasa, hingga akhirnya dokter akan bilang “tunggu waktu saja”. Jika ingin pengobatan lebih murah tanpa operasi, silahkan hubungi saya secara langsung agar kita bisa ngobrol lebih banyak dan detail. Namun saya tidak ingin menyalahi prosedur medis, hanya ingin membantu dengan cara alternatif. Gimana? tp bgmn saya bisa hubungi kk?? saya aja g tau nomor telepon kk yang bisa di hub… n mksd kk dengan cara alternatif, spt apa??? @nufusz, Trims atas apresiasinya, lain kali untuk berkonsultasi sebaiknya menggunakan halaman http://dokternasir.web.id/konsultasi agar selalu berhubungan dengan topik yang sedang dibahas. saya perlu konsultasi lebih jelas tentang meningioma yang diderita ayah saya. keluarg tidak menghendki operasi karena terlalu banyak resikonya.